Kuwait’s Public Institution for Social Security is managed by its appointed Deputy General and several other Deputies. The Director General represents this government institution in respect of its relationships with Kuwaiti citizens, public and private bodies as well as in Kuwaiti Courts. The Director General of the Public Institution for Social Security, Fahad Al Rajaan, is responsible for executing government policy. 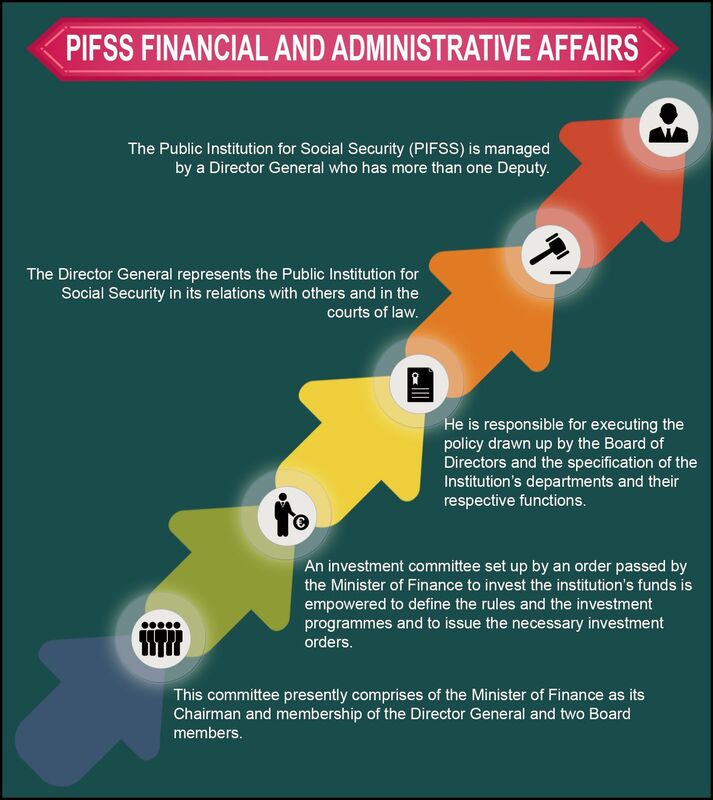 The policy is drawn up by the body’s Board of Directors in accordance with the Public Institution for Social Security’s various departments and functions. The Investment Committee of the Public Institution for Social Security was set upon by order passed by Kuwaiti Minister of Finance. The Investment Committee’s duties are to invest government funds and to regulate investment programmes. Kuwait’s Public Institution for Social Security was set up in 1976. It is a social insurance system. Supplementary legislature was implemented in 1995. The Kuwaiti Social Security scheme governs all employees, with special systems in place for military personnel and those who are self-employed. All employees who earn in excess of 1,250 Kuwaiti Dinars per month, as well as those who have sources of earnings not covered by the basic scheme, are taxed in accordance with the supplementary scheme. Those who work on a self-employed basis are subject to voluntary coverage. All insured persons are obliged to pay 6% of their earnings into a pension pot. In the case of self-employed earners, this is not applicable. Employers are required to contribute 11% of their payroll as a pension increment. The Kuwaiti government pays 12% of its covered payroll towards the national pension scheme. Contributions by Kuwaiti nationals earning in excess of 230 Kuwaiti Dinars is mandatory. The cap on monthly earnings is 1,250 Kuwaiti Dinars. The supplementary scheme requires a contribution of 5% of covered earnings by insured persons. Under the supplementary scheme, self-employed persons may make voluntary contributions of 15% of their monthly income level (though this has not yet been implemented by the Public Institution for Social Security). Under the basic scheme, both men and women must be aged 50, and have contributed towards the government scheme for 15 years (the minimum age limit is set to rise in 2020 to 55). In the case of married women and women with children who have accrued 15 years’ worth of contributions, they may draw their pension from the age of 40 (set to rise to 50 years in 2020). Additionally, those in arduous work who have made 20 years’ pension contributions may draw their pension from any age. Early pensions are drawn by those aged 46 to 49 who have made 20 years’ contributions in the case of unmarried women who have no children and in the case of men. The minimum age will be raised (under legislation to be implemented in 2017) to the age of 50 for women, and 55 for men. The Kuwaiti government recognises the need for retirement, with certain exceptions from those moving from the public to private sector, subject to certain conditions relating to length of service for those engaged in the public sector. Under the supplementary Kuwaiti pension scheme, pensions are awarded at the same time as pensions under the basic government scheme. In the case of pensions under the supplementary scheme, payment may be deferred. State pensions are not payable outside of the country. Disability pensions are awarded to those whose degree of disability reduces their capacity to work by 50% or more. Applicants are assessed by the Kuwaiti General Medical Council – again, disability pensions are not payable outside of the country. Death Grants are payable upon the death of a pensioner or insured person. Survivor pensions are payable where the insured was a pensioner at the time that they died or met the contribution requirements for a state pension. As with state pensions, survivor benefits are not payable outside of the State of Kuwait. Other than statutory pension provisions, Kuwaiti nationals are not required to pay into government schemes, which provide benefits should they need financial assistance. Kuwait is a relatively small, but very wealthy country, meaning that it can afford to take care of its citizens at times of personal financial adversity. There are some government funds that Kuwaiti nationals opt to contribute to, such as those providing medical care, maternity, sickness and unemployment benefits. These schemes are not available to foreign national residents, who would need to return to their home country if they were unable to pay for their upkeep. For ex-pats living and working in the State of Kuwait, it is imperative to take out adequate medical insurance. It is advisable to take out a policy, which would not only cover medical treatment, but loss of earnings where the employer does not pay sick pay. Some countries exclude payment of benefits to nationals who are ill and unemployed if they have resided outside of the country for a set amount of time, so this is also worth investigating.